Come celebrate all things vegan at the 7th annual NH Vegfest on April 20 from 9am until 3pm at Manchester Community College in Manchester, NH. Come be part of this growing community in the state. There will be lectures, demonstrations, vegan food, food trucks, and other vegan vendors. Bring your friends and make some new ones. Protest Fur Trapping on Loudon Rd. in Concord NH, April 20 beginning at 11 am and going to 2pm. NH Fish & Game will be having its Discover Wild NH Day on Hazen Dr. and will be prominently displaying fur trapping. Let’s educate the thousands of families who attend this event about the cruelty of trapping. Please join us for a couple of hours for the animals. 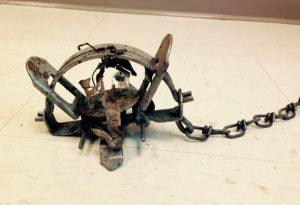 Modern Day Torture Device used to trap NH’s precious predators who we need in the ecosystem to control Lyme disease. Many other animals, including non-targets like our pets and endangered/threatened species such as American bald eagles and the New England cottontail rabbit, are also cruelly trapped. Fish and Game gave us a hard time for a permit on the Hazen Dr sidewalk. Not sure why but we needed permission from Fish and Game to stand on a state owned public sidewalk. They wouldn’t give us the ideal location of in front of the department so we made the decision to stand on the city property of Loudon Rd. instead. We hope to see many of you there to show Fish and Game we will not be deterred by their silly antics. If they want to prominently display the skins of tortured animals, we will be there to protest. It’s the least we can do for the victims of barbaric trapping. 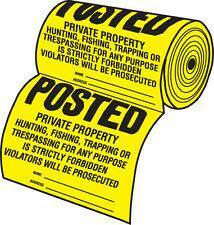 The NH Animal Rights League provides free signs to anyone who wants to post their property against hunting. It is now the time of year to post. Hunting seasons begin in September. See chart below. Following are general dates for hunting season in New Hampshire. A complete summary of season dates and bag limits is provided in the NH Hunting and Trapping Digest, published each year in August by the NH Fish and Game Department. Black bear hunting begins September 1 and they can be hunted by bait and hounding. While baiting on your property requires your permission, hunting with dogs is not. Hounders are allowed to chase, tree, and shoot on your property and there is nothing you can do about that unless you post. Females are killed also, sometimes they are still lactating. Coyotes are hunted year-round with 3 months of night hunting. Landowner permission is needed for night hunting but not day hunting. So potentially you could have hunters on your land year- round. NHARL gave a $400 matching grant for beaver protection at Sherwood Glen Condominiums in Raymond, NH. Several years ago, Art Wolinsky and his condo installed flow pipes and fencing with their own money. They recently determined some upkeep was needed—namely, the installation of a culvert protection cage—on this successful project, and so applied for help via this grant, which was approved. 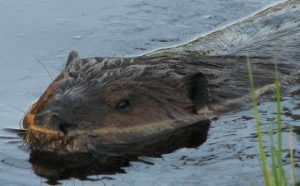 NHARL supports and promotes humane and environmentally friendly solutions in beaver management as an alternative to the lethal methods of trapping and killing beavers, offering small matching grants up to $500 towards the installation of these alternative methods (e.g. beaver pipe systems, fencing around trees). To apply for a grant fill out the GRANT APPLICATION and return to the NHARL PO Box or to our email.